At the supermarket checkout, do you find yourself reaching for the chocolate bars without thinking? It's time to stop! 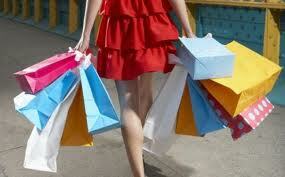 Supermarkets, clothes shops and department stores will try and entice you on a daily basis. Thought has gone into strategic placement, arrangement and pricing to get you to buy. Bargains are attractive and can reel you in like a fish to a lure. It's time to rebel, to think about what you don't need, rather than what you do need. Are you really going to watch a DVD more than twice? If you're not, then it's hardly worth paying the cost of the DVD. There are lots of alternatives to buying DVDs these days - LoveFilm and Netflix amongst others. This means you can watch TV programmes and films anywhere - on your laptop or on your family TV for a fraction of the cost. All it takes is a bit of extra effort and you can have a delicious coffee on your desk that you made from the comfort of your own home. It's also easier to avoid cake by never entering a coffee shop. I am terrible with fitness equipment buying, currently I have a kettle bell as a doorstop and several of those stretchy plastic band things which live at the back of the cupboard. It's likely that you've seen something on TV and it's convinced you that the product is a fast track to slim - unfortunately you end up with a slimmer purse instead. If you've seen something you like, why not try and create a solid paper exercise plan for using it. This way you'll be carefully considering the product before you buy, and making sure you can fit it into your current lifestyle. Whilst I understand that a bag can completely alter your life as you know it, it's worth actually doing a stock take of your wardrobe and finding out what you have already. There are certain 'wardrobe essentials' you do need - t-shirt, jeans, jacket, smart shirt, daytime dress, party dress, skirt and winter coat. However there are certain items you don't need, like a fourth pair of boots, the 50th black t-shirt and the 12th pair of jeans. Don't be tempted to go to a cheap clothes shop and buy 4 of the same t-shirt in different colours, sometimes it might be worth spending a bit extra on an item that is of better quality and will last longer. I hope this helps curb your impulse buying!